Anyone feeling a little weary? Anyone feeling the weight of a burden or burdens? Rest in God. Jesus words here are not simply about not working or taking a vacation. Jesus words are saying far more about rest in our daily journey. 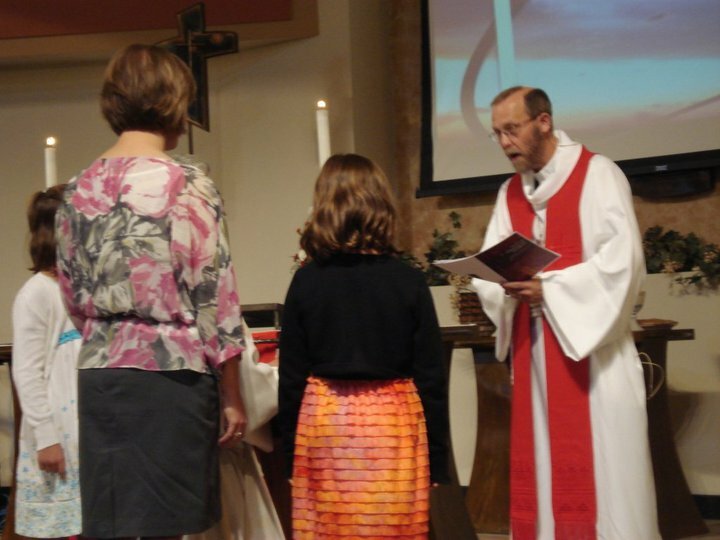 I’ll never forget when the stole was placed upon me at my own ordination. It felt like an enormous weight on my shoulders – heavier than anything that had ever been placed there before. A weight though, that on that day, I knew I did not carry alone. Christ is with you and me in our vocation as pastor, or student, or doctor, or mother, or whatever vocation we have been called to live out. On Monday evening, my family and I were headed out for dinner. As we were driving to the restaurant, my daughters were talking on the phone with my mother-in-law. My in-laws had a great chocolate lab named Mollie that increasingly become frail as she aged and her health deteriorated. On Monday, they took this beautiful dog to the vet one last time and then buried her at the farm where she loved to play. That day was a burden for my in-laws. A burden that I believe was lifted a little through the grace of their 10-year old grandchild that believes Jesus is with us and helps us carry burdens like the loss of a beloved pet. Jesus says, “Come to me, all you that are weary and are carrying heavy burdens, and I will give you rest.” Rest in God. Our congregation walked with two individuals and their families this week through death and funeral worship services. It is always an honor to preside as these times of worship and walk with families as they grieve and begin to move forward following the death of loved one. Death can be a time of indescribable burden. As the community of faith, gathered together as the body of Christ, the burden that our brothers and sisters in Christ face during times of death is lightened as we lift them up in our worship, offer prayer and words of remembrance, and things as simple as a hug or a shoulder to cry on or a meal to share. Garrison Keiller from American Public Radio’s Prairie Home Companion Radio Show, said that he used to think of his faith as a building block that one was supposed to put together with other blocks throughout life. Eventually these blocks would become strong like the brick house that the little pigs built that couldn’t be blown over by the big bad wolf. Garrison no longer believes that faith is like building blocks. He now believes that faith is about surrender. It’s a matter of walking out and leaving that house behind and experiencing the cold and doubt and confusion and times of rain in our lives and through that journey we find hope and gratitude. This past week I experienced rest in God that renewed my sense hope and gratitude in some pretty unexpected ways – the placement of a stole on a dear friend during his ordination; walking with two families through death as we celebrated and remembered the promise of resurrection that we are given in our baptism; and the quiet voice of a 10-year old girl who taught me, and probably many of us here in worship, something about Jesus’ words in Matthew’s gospel today. On this weekend in which we celebrate the freedom that we enjoy as a nation and give thanks for that freedom, may you find rest in God. This entry was posted on Thursday, July 7th, 2011 at 12:32 am	and posted in Recent Sermons. You can follow any responses to this entry through the RSS 2.0 feed.